Azure revenue grew 76 percent, but that’s slower than the near-doubling that the segment posted each quarter in 2017 and early 2018. At the same time, the PC market, which had been showing signs of stability, resumed a steeper decline. Microsoft reported second-quarter sales that met projections, though weakness in the personal-computer market and broader concern about a slowdown in cloud-services growth sent its shares lower in after-hours trading Wednesday. The company posted net income of $8.42 billion, or $1.08 a share, swinging from a year-ago loss. Adjusted profit in the period ended Dec. 31 totaled $8.58 billion, or $1.10 a share, compared with the $1.09 average estimate of analysts polled by Bloomberg. Sales climbed 12 percent to $32.5 billion, matching predictions. Microsoft’s market value soared above many of its peers during the quarter as investors bet its cloud and enterprise-software business was more stable than other parts of the technology market. While the company’s Azure revenue grew 76 percent, the closely watched segment’s growth rates have slowed from the near-doubling that it posted each quarter in 2017 and early 2018. At the same time, the PC market, which had been showing signs of stability, resumed a steeper decline in the December period. Microsoft shares slipped about 4 percent in extended trading Wednesday after the report. The stock recovered some of the losses after a conference call with analysts, when the company forecast a “solid” March quarter in the commercial business and continued improvements in cloud margins. The stock fell 11 percent in the three months ended in December, hitting a low point late in the year, as concerns emerged that tech spending was slowing, particularly in areas like PCs. Still, the stock’s decline was smaller than the 14 percent drop in the S&P 500 Index, as investors bet Microsoft’s revenue was more insulated from any potential weakness in spending on technology devices and internet ads. Investors are watching results from cloud-computing companies closely for any sign of weakness. On Monday, graphics chipmaker Nvidia slashed its revenue outlook, saying that deteriorating economic conditions caused customers to hold off on purchases of high-end gaming chips, while data-center clients avoided signing deals at the close of December. Intel, the world’s second-biggest semiconductor maker, slid last week after a disappointing 2019 forecast that cited a slowdown in spending by the biggest cloud-computing companies. Network-equipment seller Juniper Networks cited weakness from cloud customers for a downbeat revenue outlook. More broadly, business leaders and the International Monetary Fund are warning the global economy is slowing faster than expected. The downbeat reports heightened concerns that cloud-infrastructure services leader Amazon, which reports earnings Thursday, and No. 2 Microsoft are slowing spending on data centers and equipment. Investors are speculating that after years of expansion, cloud providers may have enough capacity, especially if demand for internet-based services is also softening. 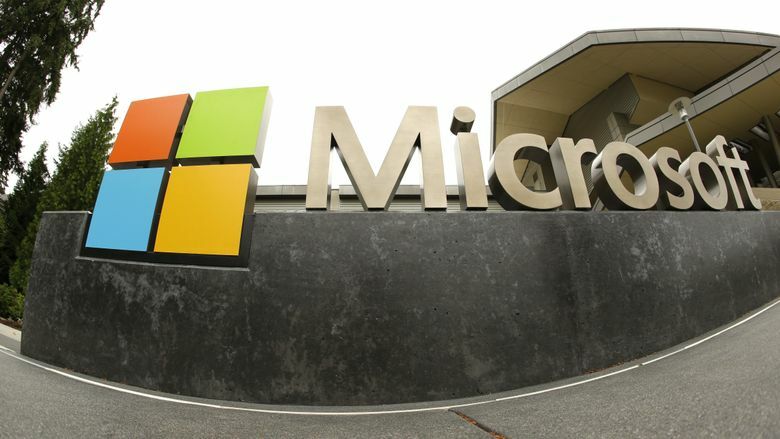 Microsoft Chief Financial Officer Amy Hood said cloud demand held up in the recent quarter and the company continues to spend on capital expenditures for the cloud. “We’re not seeing those signals,” she said about the gloomy reports from chipmakers. Hood cited the PC market as the source of the company’s failure to beat analysts’ sales estimates, noting that revenue from copies of Windows sold preinstalled on PCs fell 5 percent, hurt by a shortage of microprocessors. That will continue into the current quarter, she said. While most Microsoft investors focus intently on the cloud numbers, the Redmond company still gets a large portion of revenue and profit from personal-computer software. PC shipments fell 4.3 percent during the holiday quarter, held back by political and economic uncertainties that crimped demand, according to market-research firm Gartner. That ended two quarters of relative stability in a market that has been contracting for years.